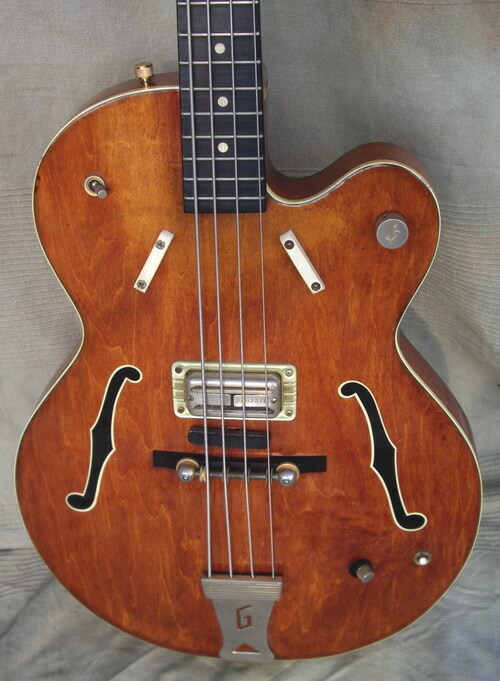 The Gretsch 6071 bass body was based on Gretsch's very popular Tennessean, consisting of a single, round cutaway hollow bound body, maple top, back and sides, padded back, two painted F-holes, two finger rests, a maple neck with 21 frets, a rosewood fingerboard and white dot inlays. 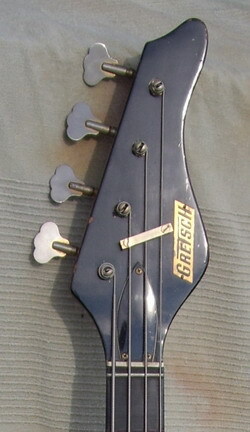 The headstock was a Fender Stratocaster-style design with a blackface and the Gretsch logo on a screwed-down metal plate, and four-on-a-side tuners. 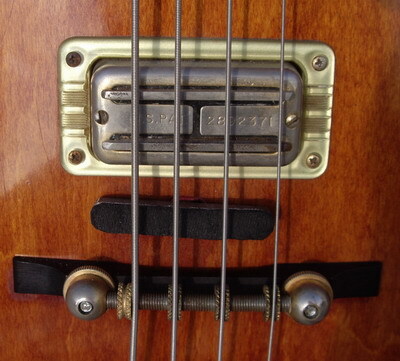 It also had an adjustable roller bridge, a trapeze tailpiece with the "G" logo on it, a string mute with switch, a covered Super-Tron pickup, volume control with tone/standby switches, and gold hardware. The finish was a beautiful Red Grained Mahogany finish. 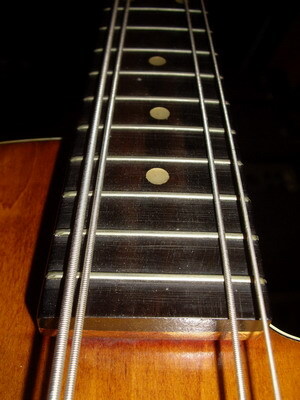 String Height (12th Fret): 3/16"
This incredibly classic Gretsch bass is just OOZING with vintage vibe! And you feel it right from the very first moment you lay eyes on it. Going even further, when you finally plug it into a powerful Eden bass stack (or whatever your own rig is) this bass REALLY comes alive. The single Super-Tron bass pickup in this bass rivals any vintage Fender Precision or Jazz pickups for clarity, response and overall balanced tone, and the mute adds an entirely different dimension to your playing. Whether its rock, blues, jazz or country, this bass will suit all styles of playing, and still has many, many years of playability left. 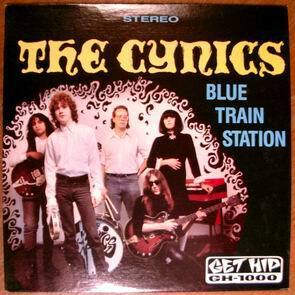 Overall, it is in EXCELLENT PLUS condition, with no apparent breaks, cracks or repairs of any kind. Everything on it is fully functional, and the original Red Grained Mahogany finish has aged to a very nice orangy-brown patina. The padding on the back is completely intact (very rare). 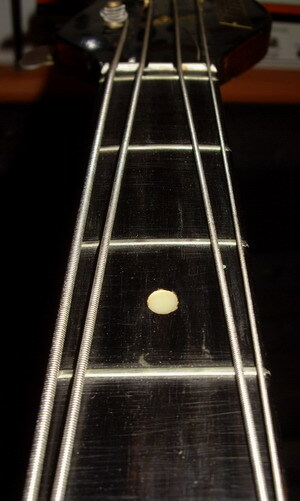 Everything on the bass appears to be original, including the tuners, the adjustable roller bridge. 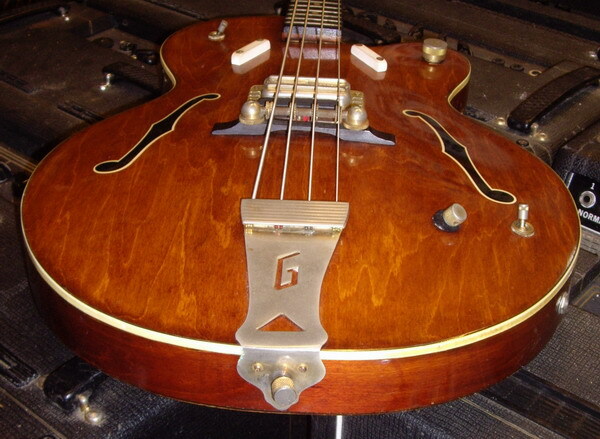 These Gretsch basses are probably some of the most undervalued basses from the 1960s on the market today. Its collectability is unmatched, and its playability is out of this world! 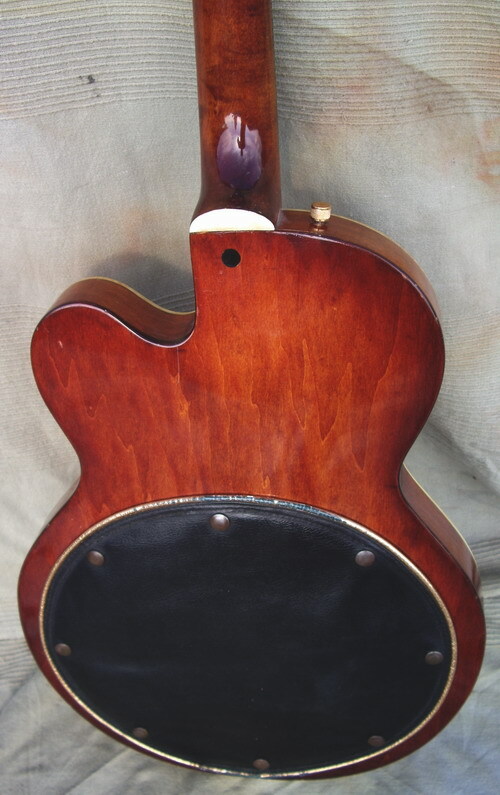 This is a rare example of this classic Gretsch model ... get it while you can!